While the fashion world is gearing up for spring and talking about the hot new trends in the season that isn’t even here yet…most of the USA is in a deep freeze. As I look out my own window this morning, it’s all white everything – the sidewalks are covered in snow and the sky is a whiter shade of pale. So over it. But still, I’m not ready to entertain fantasies of Spring and resort wear. We’ve got like two more months of these temperatures ahead of us. So I figure I might as well look cute despite the weather! Here’s the thing – Chicago DOES NOT PLAY when it comes to winter. Here people are well aware that cute and cool are all well and good, but when it comes down to it you probably will be sacrificing all that is cute and cool, and stay huddled up in a puffy sleeping bag of a coat all winter long. The North Face might as well sponsor this season, everyone you see on the street is wearing North Face something. And unfortunately North Face doesn’t yet make plus size outerwear. 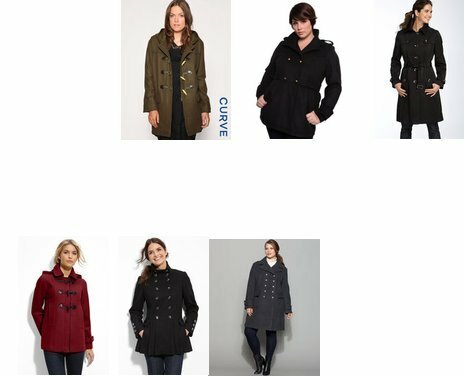 So I went on a bit of a mission, seeking the cutest, coolest, WARMEST plus size winter coats this season. And here are the stores where you should start looking! Maybe you’re like me and you prefer to try and touch an item before you buy it. Maybe you’ve been holding out and hoping to find the perfect plus size coat in person. But here’s the thing – When it comes to variety of cut, color, and brand, you really can’t do better than looking at OneStopPlus.com first. They are the ultimate online mall for sizes 12 to 44 – it doesn’t matter what number of “x” you need, they’ve probably got something for you – whereas in stores, you’re lucky to find a 3 or 4 X if that’s what you need. And they’ve got it on sale, too! Right now coats are up to 60% off, which is awesome. This season I was finally able to get THE leather jacket of my dreams – OneStopPlus for sure has the biggest range of leather and suede plus size outerwear I’ve seen anywhere, and the coats by Roaman’s are especially good quality, if leather is what you’re looking for! If you’re looking for something more funky and fun, this Newport News faux leopard swing coat could be just the topper you’re looking for. It’s funky, fun, and super fluffy. LOVE it for festive occasions! There’s a reason TJ Maxx’s slogan is “you should go” – you can’t shop online and you have no idea of what you’ll find till you get there. Does that mean that you won’t find THE perfect plus size coat at Marshalls or TJ Maxx? Well, it really depends on what your local store is like. I’ve learned that plus size departments can vary wildly from store to store. For example, the TJ Maxx on State Street in the heart of Chicago’s downtown loop usually has at least four racks of plus size clothes. The Marshalls just off of Roosevelt started out with a decent plus section and apparently has decided to whittle it down to just one lonely rack of picked-through clothes, which is just sad. Every time I go there, plus size shoppers are just circling the rack with despair in their eyes. However! I was able to find THE coolest coat there! It’s by Green With Envy “>, a vegan fashion brand. I can’t find a link to my exact coat online, but it’s kind of like the one you see pictured above, except raspberry with a belt and silver accents. I love it! It makes me feel super jaunty and bright against this winter landscape. AND I paid like $50 for it! If you’re seeking a very specific coat, you’d be smartest to start your shopping online. But please know there probably is something cute just waiting for you at Marshalls or TJ Maxx, if you’re willing to search for it. As the name would indicate, Burlington is a GREAT place to begin coat shopping. But again – it really depends on where you live. When I lived in Miami, my nearest Burlington was in a pretty decent mall. Selections may have been a tad picked through, but I could generally find what I was looking for – the heavy faux fur lined Jones New York coat that I turn to on the coldest winter days, was purchased at the Burlington in Miami. My visits to Burlington Coat Factory stores in the downtown Chicago area have left much to be desired in terms of the quality of selection, the range of sizes, and the location of stores (which can be a tad on the divey side). The last time I went, the plus size selection was weak. But in a city near you, it could be much better so I still won’t discount Burlington as an option just yet. But there really could and should be a Burlington in the downtown loop, they’d clean UP! Those have been my discoveries in the quest for the perfect winter coat. And I’m going to start featuring my fave picks from ShopStyle, which gathers all the stores you LOVE and posts them in one place. Click to check out my military-influenced outerwear picks below! Where did YOU find your cool winter coat? I found a great black AND a red wool belted peacoat at Overstock.com for an awesome price and pretty quick standard delivery. I was very pleased! oooh, I never check Overstock! Great tip! I’m really feeling that leopard swing coat. I just bought a black faux fur from a consignment shop this weekend. Can’t wait to wear it! I love the coats. Beautiful coats make the winters go by easier. On my way to Burlington tomorrow when the temperatures here go back up to a balmy 36. My husband got a great coat there last winter and I got my beloved Columbia ski jacket there many seasons ago. I got a well-meaning gift from my sister that let me know it was time to retire the Columbia, but it was neither warm nor cute, hence the trip. ASOS has some great coats, but so does H&M and Gap. I have that Green With Envy coat and I love it! I got it from Sam’s Club for $40….then I saw them in Dillards and Macy’s for $150!! Score! Ladan’s closet. Love them! I bought two coats. They do plus size outerwear like no other and have the cutest, on-trend colors and styles. Whenever I shop for anything, I swear that I won’t buy anything black, charcoal, etc. In most plus size stores I see black, black, black. I bought a yellow short cape/coat and a camel jacket from them. They’re a little on the pricey side but the quality assures that anything you buy will be a wardrobe staple for years to come. Although I’m not plus sized I shop for my daughter who is a confident 2x. My favorites for buying coats for her is Lands End, Eddie Bauer and JCpenney. All of them have excellent selections of down coats, in fitted shapes and great colors. And right now is the best time to buy! I threw cute out the window a long time ago and opened my door to warm and functional. I live in my 1 MADISON coat i got on ideeli.com for less than 50% off the original price. It is very warm and comes with a fur hood which is also lined inside with faux fur. It is also belted at the waist which still leaves room for cute! With regard in the aim of espousals praise rite, there are very several completely different attire possibilities with regard to espousals praise symphony. The 1st alternative which should be founded is regardless of whether the few would like remain or prerecorded symphony. If be alive, they then need to pitch upon from choirs, particular Dresses. using the couples who would want to have a title to prerecorded symphony playing, they are able to pitch upon it may be vocal or subservient selections to grasp out all through the espousals praise rite.karen millen dresses suite best. Do you want to know more notice about women’s appearance clothes. Are you confused by how to choose a garb. Here is the best alternative for every woman, here you learn much notice about appearance sweep. If you accompany our trade untarnished I think you will not sorrowful longing advent here. Here is CPD Dusseldorf 2011. Come and take pleasure in! Récemment, le célèbre designer Antoinette Lee, pour les enfants con?oit quelques sacs longchamp mickey. Hong Kong has been exposed on the shape cultures from both Westerners and Easterners along with leading brand names like Louis Vuitton, Gucci, Prada, Bally, Loewe, Dolce-Gabbana, Balenciaga and also the brands from limited designers. These top global brands all have their branches in Hong Kong. Shopping areas can be found on almost every way as shopping can be started right away after advent out from any rail location. For instigation, Admiralty tract|realm|territory|domain|circle|area} is full of shape shops and big part stores which need more than a week to perform exploring. and videos, this website could definitely be one of the best in its niche. Thanks for sharing your thoughts on home renovation grants.